"I feel 10 years younger! Thank you Fresno Hair Solutions." We begin with a private consultation with one of our expert image consultants. We will perform a "micro-video" analysis to help determine how to approach your hair loss condition. Our technician will pay attention to your age, lifestyle, and skin color, as well as the texture and density of your hair. If you are suffering from hair loss, it can be difficult to talk about because it is your appearance and self identity. 30% of women under 50, and 50% over 50 suffer from female pattern hair loss. At Fresno Hair Solutions our consultants are here to restore your self esteem. Finally a solution that works. Let the professionals at Fresno Hair Solutions consult with you & find solutions that fit your lifestyle. 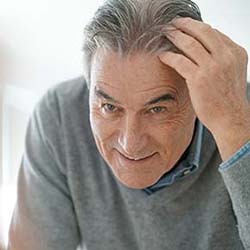 There are many reasons for thinning or balding hair. Androgenetic Alopecia, or hair loss due to hormonal changes are very common in 90% of mail hair loss cases. Let us perform an analysis that help us find your solution. If you are suffering from hair loss, then you understand that when you lose your hair, you lose more than your hair. You lose your natural appearance. You cease looking like you. When this happens, it’s hard to feel good about yourself. It’s difficult to enjoy life’s simple pleasures. At Fresno Hair Solutions we restore more than just your hair. We restore your image, confidence and self esteem. We blend “state-of-the-art” with “fine art” so that in the end, we do more than restore your natural appearance. We restore your life. Fresno Hair Solutions offers our clients the most cutting edge hair replacement technology in order to bring you a hair loss solution that is virtually undetectable to both sight and touch. 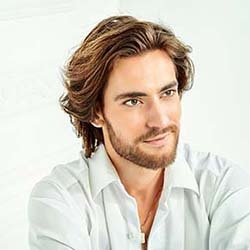 Our hair replacement technicians are talented, creative and have the experience to give you a cut, look and style that you will love and that is uniquely your own. Each system is hand made and tailored to fit your individual characteristics, following the shape and contours of your own scalp. We’re Affordable .... Unlike our competitor, we are not a big corporation. We are a family owned and operated business and our goal is to give our customers 100% satisfaction in our services. Because we are family owned and operated, we keep things really simple. Our overheads are low, our costs are low, our administration charges are low and we pass these saving to our clients. We start the consultation with Forensic Hair Loss Analysis using our state-of-the-art micro-videoscope. We will analyze your current hair growth by examining your hair follicles and identify any signs of live follicles or future hair growth. From this analysis, together, we can determine the proper treatment for your hair loss solutions.